Ich suche eine App mit der ich einstellen kann, welche Apps nach einem neustart gestartet werden und welche nicht. Ich habe am Samstag beim Einkaufen mein Geldbeutel verloren. Ich hatte es noch garnicht bemerkt. Einkaufen mit Frau und klein Kind kann schon mal etwas kaotisch sein. Ich muss morgen mal schauen, wie ich bei #servercow die #Samba / #cifs Verschlüsselung aktiviert bekomme. Zur Zeit kann ich den Traffic mit Tcpdump noch mitlesen..
Hab nun eine 1TB SSD mit QLC von Samsung gekauft. Btw: ich habe nicht die günstigere Sandisk plus 1TB mit dem schnelleren TLC genommen, weil es auf Amazone wiederholt Berichten zu schlechten Zugriffszeiten gab. Die erfolgs Serie "The Brexit" bekommt am 30. März eine weitere Staffel. Ich denke die meisten Wlan Geräte funken nach dem Wlan Type N mit einer Antenne und erreichen maximal 150 Mbit/s brutto. Für den optimalen Netto Wert muss man ca. 50% abziehen und kommt so auf 75 Mbit/s. Also 9.38MB/s, wovon dann aber noch mal für das benutze Protokoll etwas abgezogenen werden muss. Beim Wlan Typ AC kommt man mit einer Antenne auf 433 Mbit/s brutto, wobei man hier auch ca. 50% für den Netto Wert abziehen muss. Damit kommen wir auf ca 216,5Mbit/s oder 27,1MB/s. Moderne Smartphone haben in der Regel zwei Antennen und kommen so im 2,4 Ghz Wlan auf 300Mbit/s Brutto / 150Mbit/s Netto = 18,8MB/s oder im 5Ghz auf 866Mbit/s Brutto / 433Mbit/s Netto = 54.1MB/s. Natürluch gibt es auch schnellers Wlan aber das Accesspoint und Wlan Client jeweils mit drei, vier oder mehr Antennen funken, dürfte doch die Ausnahme sein. Von Devolo gibt es die Wif pro Modelle 1200 / 1750. Beide Versionen gibt es mit internen oder externen Antennen. Option ist eine PoE Versorgung möglich. Die Geräte kosten bei Amazon von 29,90€ bis zu 69,90€, je nach Ausführung (Antennen 'i'ntern oder 'e'xtern) und Geschwindigkeit. Aber warum erzähle ich euch das? Weil es seit kurzen Openwrt Firmware (snapshot) für die Accespoints gibt und weil die 1750 im Sale für unter 30€ verkauft werden. This blog posts describes how to issue Let's Encrypt certificates for internal servers. We used this mechanism to issue a cert to 65,000+ internal machines. Let’s Encrypt is a revolutionary new certificate authority that provides free certificates in a completely automated process. These certificates are issued via the ACME protocol. Over the last 2 years or so, the Internet has widely adopted Let’s Encrypt — over 50% of the web’s SSL/TLS certificates are now issued by Let’s Encrypt. But while there are many tools to automatically renew certificates for publicly available webservers (certbot, simp_le, I wrote about how to do that 3 years back), it’s hard to find any useful information about how to issue certificates for internal non Internet facing servers and/or devices with Let’s Encrypt. This blog posts describes how to issue Let’s Encrypt certificates for internal servers. At Datto, we issued a certificate for each of our 65,000+ BCDR appliances using this exact mechanism. To issue a certificate through Let’s Encrypt, you must prove that you either own the website you want to issue the certificate for, or that you own the domain it runs on. Typically, automated tools like certbot use the HTTP challenge to prove site ownership using the .well-known directory. While this works beautifully if the site is Internet-facing (and Let’s Encrypt can verify the HTTP challenge files via a simple HTTP request), it doesn’t work if your server runs on 10.1.1.4 or any other internal address. The DNS challenge solves this problem by letting you prove domain ownership through the DNS TXT record _acme-challenge.example.com. Let’s Encrypt will verify that the record matches what it expects and issue your certificate if it all adds up. The following diagram shows how we have implemented our Let’s Encrypt integration for our Datto backup appliances. Each appliance (read: internal server) is behind a NAT and carries its own local IP address. The general approach is simple: The appliance regularly reaches out to our control server to ensure that it can be reached via its own subdomain. If its local IP address changes, it triggers an update of its own subdomain. In addition, it checks regularly if the certificate is still valid, and requests a renewal if it’s outdated. * Steps 1-3: First, it needs to set/update its own DNS domain (here: xi8qz.example.com). This domain will later be used as a common name (CN) in the certificate. On top of that, it needs to make sure that this record is updated every time the server’s IP address changes. * Steps 4-14: It needs to regularly check if the local certificate needs to be renewed and request a renewal if it’s time. Obviously, if there is no certificate it needs to be “renewed”. Let’s now examine these steps in greater detail. On top of that, we need the ability to dynamically add and remove records from it (via an API of some sort). I’ve previously written about how to spin up your own DDNS server, if you are interested. Assuming you now control the DNS zone for example.com completely and you can quickly edit it dynamically, you’re all set for actually issuing certificates for your local device domain via Let’s Encrypt. For our example appliance, it will regularly check if the existing certificate is still valid (step 4). If there is no certificate or the existing one is about to expire, the device will generate a keypair and a certificate signing request (CSR) using its assigned hostname (here: xi8qz.example.com) as a CN, and it’ll send that CSR to the control server (step 5). "value": "xi8qz.example.com" "expires": "2018-04-15T21:26:29Z", "uri":"https://acme-staging.api.letsencrypt.org/acme/challenge/VtjihR4X8nLAj4MDwI...", "token": "aLptEKAeUOajkiGrx-kkbjUX4b1MC..."
Using this response, the control server must set a DNS TXT record at _acme-challenge.xi8qz.example.com (step 8) and notify the ACME API that the challenge response has been placed (step 9). Once the challenge response has been verified by Let’s Encrypt (step 10-11), the certificate can finally be requested using the CSR (step 12-13). It’s important to note that if you are considering implementing this mechanism for a large number of servers that you use the Let’s Encrypt staging environments for testing and, more importantly, that you consider their rate limit restrictions. By default, Let’s Encrypt only allows you to issue 20 certificates per week for the same domain or the same account. To increase this number, you have to either request a higher rate limit or get your domain added to the public suffix list (note: adding your domain here has other implications!). Due to these rate limits, it is vital that you spread out the initial deployment enough to stay under the rate limit, and that you leave enough room for future servers to be added. Also consider renewals in the initial rollout plan. As you can see it’s not really rocket science. We first assigned each appliance (aka. internal server) a public domain name using our own dynamic DNS server and a dedicated DNS zone. Using the server’s assigned domain (here: xi8qz.example.com), we then used Let’s Encrypt’s free certificate offering and their DNS challenge to issue a certificate for that server. By doing that for all internal servers, we can provide secure communication in our internal IT infrastructure without having to deploy a custom CA cert or having to pay for certificates. Iʼd very much like to hear what you think of this post. Feel free to leave a comment. I usually respond within a day or two, sometimes even faster. I will not share or publish your e-mail address anywhere. Seit dem ich #Hubzilla und #Matrix / #Riot Zuhause hoste bin ich der Herr über meine Daten. Beide Systeme sind sehr vielseitig und mit vielen weiteren Diensten und Servern verknüpft. 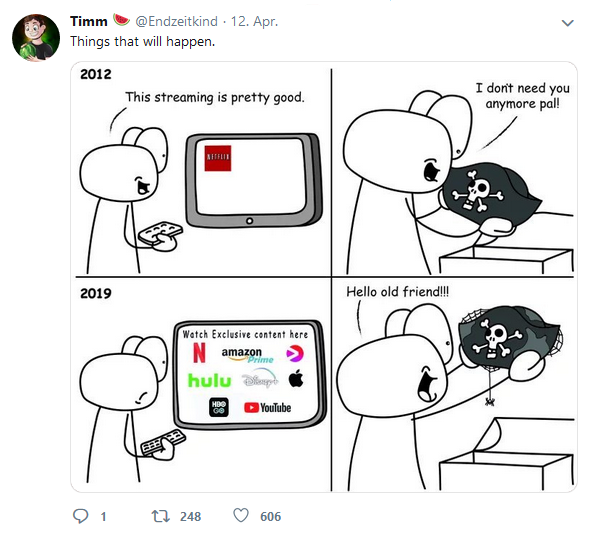 Mit Hubzilla steht mir auch die Welt zu #Diaspora, #mastodon und anderen Sozialen Netzwerken offen. 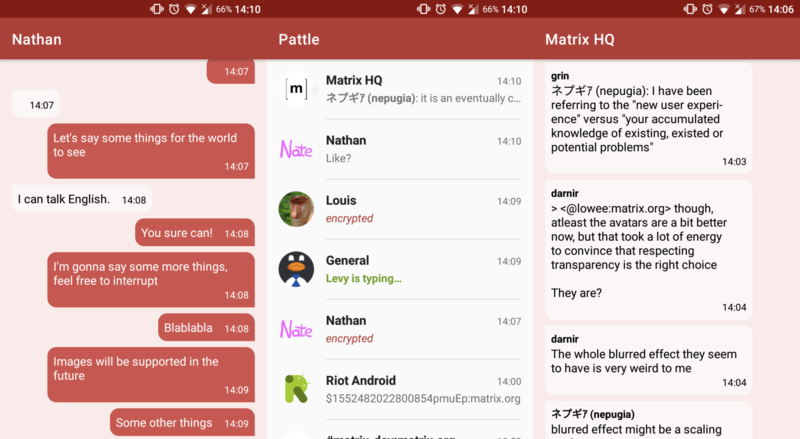 Matrix verbindet sich wie Hubzilla mit vielen anderen Servern und ermöglicht mit "Brücken" auch die Kommunikation zu #IRC, #Telegram, #Slack oder auch #Whatsapp. @marlon wie hoch sind dabei ungefähr deine Kosten pro Monat für die Server und wie viel Zeit musst Du pro Woche investieren? Ich habe es nicht getestet aber es gibt wohl eine Whatsapp Bridge.. Sorry, keine Ahnung. Ich nutze ein altes stromsparendes Notebook mit corei5 als Server und daher habe ich nur Stromkosten. Naja und Matrix habe ich nun frisch installiert. Dafür ist viel Zeit drauf gegangen aber nun läuft es. Generell muss man sich um einen eigenen Linux Server wenig kümmern, wenn man Wartungsaufgaben automatisiert..
ohne daten an fb zu übertragen? sagt bescheid sobald matrix mit signal reden kann. Using direct push transfer instead of the notify/pickup delivery model. Inclusion of ActivityStreams (JSON-LD) as a supported (primary) serialisation. Dropping the requirements for implementations to support secondary serialisations. Moving service discovery to "Accept-header" based service endpoints where different representations can be selected by modification of the HTTPS request accept header. Separation of the portable-id from the signature algorithm used. The photo cache addon provides the photo cache app which can be enabled per channel and increases anonymity in the world wide web. Public photos will be cached at your hub. The queueworker addon (admin only) implements an enhanced queue worker. This is only important for site admins. The addon is still marked experimental but does a pretty good job already. It has the potential to improve queue handling especially for big sites. The gallery addon provides the gallery app which has been enhanced and has now extended functionality: photos in posts/comments can now be viewed in the photo viewer directly from the stream and and images at the beginning of a post will be converted to an album. The TOTP addon provides per channel two factor authentication using timebased one-time passwords. Besides that we have implemented many usability enhancements and fixed reported (and not reported) bugs. Please refer to the changelog for a more detailed list of changes. A big THANK YOU! to all developers, translators and everybody who is helping to improve Hubzilla with each release. Hubzilla 4.0 requires PHP 7.1 or higher. Versions 7.2 or 7.3 are recommended. There are several DB updates which can take a looong time (depending on DB size) to complete. Please be patient. If updates fail due to server timeout, you will need to apply the failed updates manually. In case you attended the RC testing, remember to git checkout master your core and addon repositories prior to the upgrade. Nope, the password is much much weaker than you might expect, but you need to really think outside the box. The second point is a very relevant observation, but you havenʼt understood the significance of it yet. https://twitter.com/bofh453/status/1101335595916451840?s=19 … The reason it looks like left/right keyboard mashing is because the Zhuyin layout puts initial consonants on the left side of the keyboard and vowels/rimes on the right of the keyboard. LOL ITʼS "我的密码". Literally "My Password". My immediate guess is it corresponds to something really obvious if you enter it in via Cangjie (or possibly some other Chinese IME). Not sure what, tho. Maybe something generic as "password" but typed on a Chinese or Japanese keyboard, while treating it as QWERTY? I’ve recently changed every last one of my passwords to random gibberish ones which my iPad supplied. They will come up when I go to log in anywhere. It was just too much to do it any other way. Please tell me this is at least fairly secure! Of course, donʼt actually use that as a password. Itʼs just my standard "Hereʼs a passphrase example." The key is itʼs a nonsense sentence in proper English (or whatever you speak) that uses a number /somewhere/. Thatʼs why I said using a manager is the best idea for most sites. The passphrases are for when you canʼt use a password manager (like for the manager itself). Iʼve found myself regularly resetting passwords because Iʼve forgotten the previous one. Secure each time. Wondering how secure doing an email reset every time would be (assuming secure email)? Means near one-time-use passwords and effectively 2fa. My email passwords are now gibberish too.